Kudos to The New Republic for this takedown of a recent Wall Street Journal editorial. The Murdoch newspaper was trying to gin up sympathy for the Koch brothers, the fossil-fuel billionaires who pour big money into the conservative Meme Factory and into political campaigns. The Journal tried to make the case that the Kochs have actually been outspent by organized labor — without noting that there are two Koch brothers and 14.5 million labor union members. 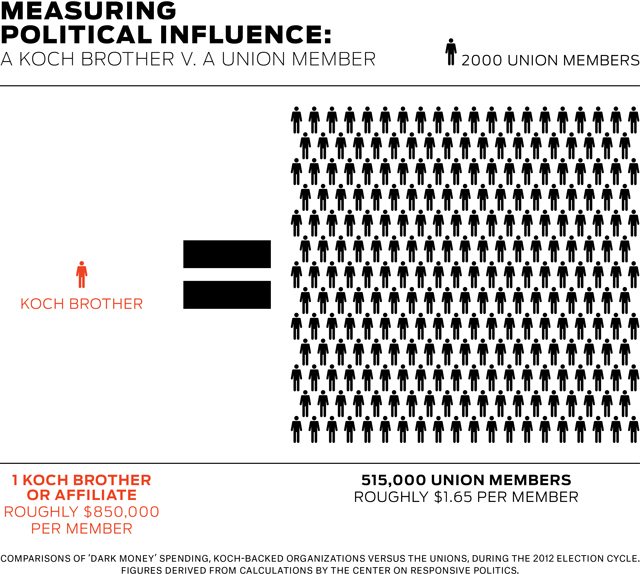 When the Kochs are treated as individuals (as the Constitution would indicate), the TNR piece calculates that each Koch brother is exercising the same level of “political speech” as about half a million union members. Can anyone really argue that amplifying those two voices by the millions of dollars they have to spend makes the country a better place? Does their wealth make their ideas more worth listening to? Does their wealth make them wiser? Does it mean they love their country more than others? Why should they have a megaphone that their neighbors do not have? If they want to speak, let them speak. If they want to publish, let them publish. And let them do so without limitation. But spending money is not protected by the First Amendment (and nor should it be). As a First Amendment militant, I believe speech should be free. It shouldn’t be paid for. Today’s report about the influence of money in politics is the inevitable progeny of the 2010 Citizens United ruling. One of the worst parts of that ruling was the deep misconception at the heart of it: that spending money equals political speech. That flies in the face of common sense, human experience, and two centuries of constitutional interpretation. But we seem to be stuck with it, at least for now. Today’s story in the Times also carries a whiff of “false equivalence,” because for every liberal zillionaire like Tom Steyer, there are probably dozens of conservatives like the Kochs. They are all seeking unaccountable ways to give unlimited amounts of money to shape our politics. It’s wrong, and we will regret it. Let these same people give all the speeches their throats can make. Let them write all the essays, pamphlets, and letters they like. As citizens, each of us is entitled to use our voices to persuade the others. But having a hundred million dollars does not make any citizen more virtuous, more patriotic, or wiser. It just makes you louder. History keeps happening. Now, a U.S. appeals court has ruled that the activity of hitting “Like” on a Facebook is a form of expression that deserves free-speech protections under the First Amendment. An earlier ruling in a lower federal court went the other way. But on Wednesday (9/18), the 4th Circuit Court of Appeals in Richmond reversed and said an employee who “liked” a political candidate was engaging in political speech and therefore cannot be punished by his employer. Facebook and the American Civil Liberties Union, which filed friend of court briefs in the case, applauded Wednesday’s ruling. ‘‘The Constitution doesn’t distinguish between ‘liking’ a candidate on Facebook and supporting him in a town meeting or public rally,’’ said Ben Wizner of the ACLU . This ruling seems not only common-sensical, but it also seems to right a terrible wrong: when the Supreme Court said that spending equals speaking, that gave rich Americans a tremendous advantage in the competition to make points in the public sphere. This ruling says that using Facebook is a form of speaking, too, so it deserves protection. The First Amendment lives. Let’s keep it going. Should corporations enjoy free speech? For no good reason, our laws (both legislative and the common-law, judge-made type) have been moving in a while in the direction of recognizing corporations as “persons” and granting them most of the benefits of being a person, while sparing them most of the downsides (like dying, paying taxes, and feeling inadequate). The latest flash point in this development involves a petition campaign to try to use the power of government to force corporations to divulge how much the spend on political campaigns and who gets it. Such a move would limit the free-speech rights of corporations — but only to the limit already imposed on us actual living persons. As matters stand, a real live human being who donates to a political campaign has to do so knowing that the donation will be a matter of public record, available for inspection in the records of the Federal Election Commission. 1. The shareholders. In theory, the management of every publicly traded corporation has a legal responsibility to maximize shareholder value. Some shareholders may believe that such a duty does not extend to dropping millions of their dollars into the campaign treasuries of political candidates. 2. The customers. In theory, consumers have power that they can exercise over companies who do things they don’t like, but only if they can find out what’s going on. One reason that corporations like to exercise their free-speech “rights” in secret is so that they don’t have to face backlash and boycotts from angry consumers. All of this can be remedied with a simple change: The Securities & Exchange Commission, the federal agency that oversees U.S. corporations, could simply require corporations to publicly disclose their political donations. That is no more onerous than what is required of you or I as an individual. In fact, the five SEC commissioners have a petition pending before them asking them to do just that. I hope that the three Democrats on the panel will find the gumption to do just that. (I have no hope that either of the two Republicans will do so). I’m not familiar with SEC rule-making. I found this page that records comments that have already been received. I don’t see any way to comment on-line. So, I would urge you to scroll over the phrase “Type A,” print that out, and send it by snail mail to the SEC. I’m sure that if I were a corporation, I could figure this out. For the record: I am not convinced that a corporation (a legal fiction created by the state to serve social purposes) has any rights, but I am certain that they do not have more rights than you or I. The following Letter Type A, or variations thereof, was submitted by individuals or entities. In particular, I am appalled that, because of the Supreme Court’s ruling in Citizens United v. Federal Election Commission, publicly traded corporations can spend investor’s money on political activity in secret. I am writing to urge the Securities and Exchange Commission to issue a rule requiring publicly traded corporations to publicly disclose all their political spending. Both shareholders and the public must be fully informed as to how much the corporation spends on politics and which candidates are being promoted or attacked. Disclosures should be posted promptly on the SEC’s web site. Here is a view from Suketu Mehta, the author of the wonderful book Maximum City, about Bombay. This year, the world’s largest democracy ranked a miserable 140th out of 179 countries in the Reporters Without Borders Press Freedom Index— falling nine places from last year. Today, Afghanistan and Qatar have a freer press than India. In recent years, the government has cast a watchful eye on the Internet, demanding that companies like Google and Facebook prescreen content and remove items that might be deemed “disparaging” or “inflammatory,” according to technology industry executives there.